One of the men involved in the fisticuffs blames the fight on the women taking the video, saying they’re ‘full of sh*t’. 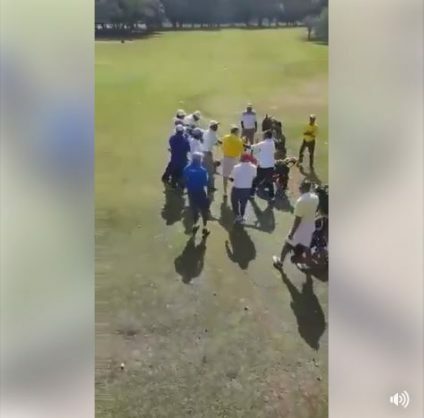 A video of a fight between golfers at Windsor Golf Club has emerged and left social media users furious. The video shows a group of white men clashing with Indian men. The women taking the video can be heard saying they will post the video on Facebook. The incident starts with an argument between two men as the others look on, but turns into a full-blown physical altercation when a white man throws the first punch. One of the men blames the women taking the video, saying they are “full of sh*t”, and the women retort by calling him a “f*cking idiot”. According to Facebook user Yunus Elias, who posted the video, “apparently the Indians were turning around after the 1st 9. The white guys tried to go before them. They approached the caddie master who allowed them to go through. An argument started and the white guy called them coolie and black charous [sic]. That’s when the fight started”. Windsor Golf Club said it heard about the fight, but no complaint was laid.